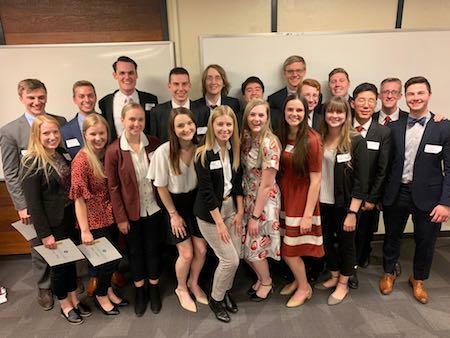 CAS Student Central » Awards » Arizona State University’s GIS Chapter Hosts CAS Case Competition with Brigham Young University! Arizona State University’s GIS Chapter Hosts CAS Case Competition with Brigham Young University! Reprinted with permission from Arizona State University (ASU). Written by Kinsey Turk, a sophomore and CAS Student Ambassador at ASU. Original version available online. 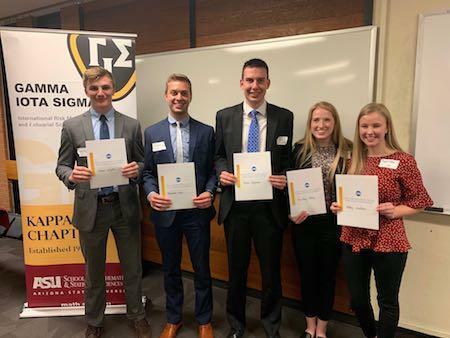 The Gamma Iota Sigma Kappa Chapter at ASU (GIS @ ASU) hosted its 4th Annual Casualty Actuarial Society (CAS) Case Study Competition on March 18. Unlike past events where ASU teams competed against only one another, this year ASU’s two teams competed against special guests from Brigham Young University (BYU). The BYU faculty and two student teams made the 10-hour trip down to Tempe to participate in the exciting case study and network with students and faculty from ASU. The focus of the CAS Case Study was to utilize Microsoft Excel to present information to a panel of judges about a commercial property book of business in catastrophe-prone areas. Some of the challenges included cleaning spotty data, creating a dynamic underwriting report, and finding creative and clear ways to present vast amounts of data. Each of the four teams had a unique and fresh take on the data and provided fantastic graphics. After all of the talented groups presented, the panel of judges deliberated and chose the winning team: BYU’s team consisting of Brandon Allen, Jason Colgrove, Courtney Jolley, Abby Walker, and Cason Wight. Along with the prestige of winning, the team was awarded $2,500, generously provided jointly by the ASU School of Mathematical and Statistical Sciences and the CAS. Aside from the amazing work each of the students contributed to their presentations, the night was an excellent opportunity for fellow actuarial science students and faculty to mingle while building connections across state lines. Interacting with outside universities is a rare and gratifying experience for all involved and made the CAS Case Study an absolute success. GIS @ ASU would like to thank the panel of judges for taking the time to volunteer and BYU for journeying out to Arizona to participate in the competition. GIS @ ASU is looking forward to having a potential rematch in the coming year and to further connect with students in the actuarial science field in the Southwest.